I had a great idea the other day, and brought it up with the Crankee Yankee. As there seem to be so many people on the road who are not paying attention, fiddling with their phones and so on, how about we outfit our cars to protect ourselves (and our vehicles as well)? So I got thinking. Why can’t we do the same thing with our cars? I have no idea whatsoever how the police would view this, but wouldn’t you think that this might keep a lot of accidents from happening? Say you are driving along the highway, minding your own business and your car was protected by lots of old tires all around it. Suddenly, someone bangs into your car because they were not paying attention. What happens? Nothing happens to your car, and the other car just bounces off. No harm, no foul. See where I’m going with this? It’s a handmade “accident avoidance system.” Instead of the fancy technology that wants to drive your car for you, change your air to make you think you are in a Hawaiian garden, play the tunes only you like and so on; this would keep people alive, their cars out of the pricey repair shop, and cut down on distracted driving. Of course, I’m sure that our police force would have some issues with this low-cost SPAS idea. There’s probably some old blue law somewhere in the dusty books that would take issue with the “improper use of old tires,” but hey—wouldn’t it give the police a few chuckles? 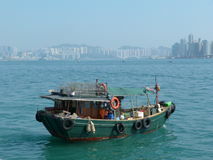 *Old fisherman boat in the sea with tall building background in Hongkong.